Mint Ice Cream Swirled with Chocolate Sauce and Milk Chocolate Pieces. 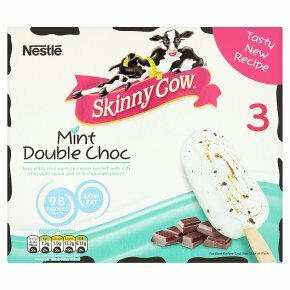 98 Calories per stick. Low fat. This yummy product contains no artificial colours, flavours or preservatives. Suitable for vegetarians.Taste the Upside Irresistibly cool mint flavoured iced dessert swirled with rich chocolate sauce and milk chocolate pieces. With 98 Calories and 1.5 grams of fat, there's happiness in every bite.